For organisms with complex life cycles, longer time spent in the plankton by dispersing propagules can cause reduced survival, growth and fecundity, which could alter interactions between neighbours in the post-dispersal environment. We compared post-settlement performance of bryozoan Watersipora subtorquata colonies that developed from larvae of different natural and experimental planktonic durations over ca. 15 wk of colony growth. Settlers were situated either near established adults of the ascidian Botrylloides leachii or without competition. Increased larval planktonic durations reduced colony growth in the absence of competition; colonies that developed from longer or delayed larval durations were 2 to 3 times smaller than those that developed from shorter durations. Colonies that developed from longer larval periods (natural or experimental) also experienced higher mortality (75 to 100%) than those that settled quickly (20 to 42%), but these effects varied between experiments and seasons. In winter, W. subtorquata colonies of longer larval planktonic durations experienced greater mortality when adjacent to established B. leachii, whereas differences in colony growth due to planktonic duration were reduced by adjacent B. leachii. The influence of B. leachii varied between experiments in different seasons, however, and did not alter colony performance in summer. Our findings demonstrate that while increased larval planktonic duration can be costly for post-dispersal growth and survival, some differences can be mediated by species inter- actions and environmental variability. This suggests that while connectivity among populations that take longer to disperse may be limited, it may also be influenced in complex ways by the post-recruitment environment and not simply dispersal duration. Influence of a burrowing, metal-tolerant polychaete on benthic metabolism, denitrification and nitrogen regeneration in contaminated estuarine sediments. Joanne L. Banks, D. Jeff Ross, Michael J. Keough, Catriona K. Macleod, John Keane, Bradley D. Eyre. Marine Pollution Bulletin 68 (2013) 30–37. D. Jeff Ross, Andy R. Longmore, Michael J. Keough. The broad spectrum of anthropogenic pressures on many of the world’s coastal bays and estuaries rarely act in isolation, yet few studies have directly addressed the interactive effects of multiple pressures. Port Phillip Bay in southeastern Australia is a semi-enclosed bay in which nutrient management is a major concern. In recent years it has been heavily invaded by marine pests. 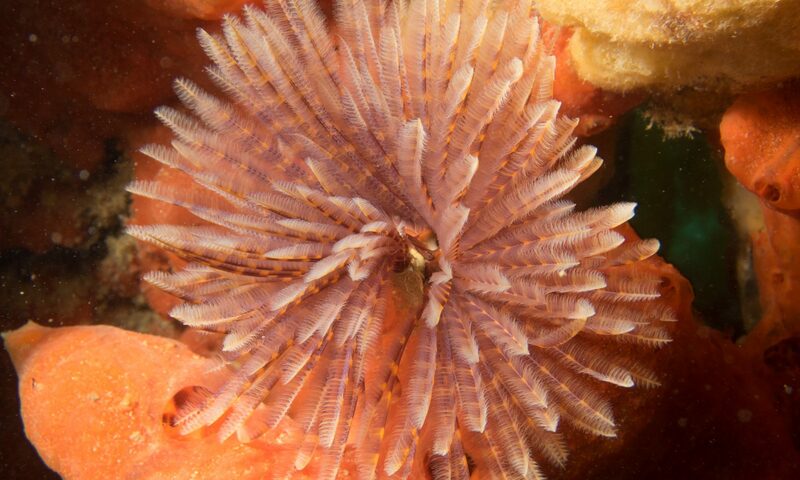 We manipulated the density of one such invader, the European fanworm Sabella spallanzanii, and showed that it causes changes in the composition of macrofauna in the surrounding sediments, provides habitat for epibiota (both fauna and flora) on Sabella tubes, and reduces the biomass of microphytobenthos on the surrounding sediments. Of greatest concern, however, was the indirect impact on nutrient cycling. We suggest that the impacts on nutrient cycling are largely due to the feeding of Sabella and the epifauna on its tubes, capturing organic N before it reaches the sediment, excreting it back up into the water column as NH4, thereby bypassing sedimentary processes such as denitrification. Most notably, the efficiency of denitrification, the key ecosystem process that permanently removes N from the system, fell by 37–53 % in the presence of Sabella. Importantly though, this study also demonstrated significant spatial variability in fauna, geochemistry and the magnitude of Sabella effects. Given that the effect of Sabella is also likely to vary in time and with changes in density, all of these sources of variability need to be considered when incorporating the effects of Sabella in nutrient management strategies. species at the densities used here reduced mussel growth and flesh weight, likely resulting in economic losses for the industry, and requires consideration when developing biofouling mitigation strategies.